The angry rhetoric coming from the White House concerns us. In the same way that racism or sexism applies a criticism across a group as a whole, looking out across a political rally and describing the media as "the enemy of the people" is just wrong. Also wrong is claiming partisanship on the part of 35,000 civil servants who work for the FBI when that same White House appointed many of those at the top. And a statement like "Don't believe what you see or read" sounds like something you would hear on the news about a dictatorship or a 3rd-world country. Three other cards from the series. ⬆ This card simply stated the oath of office which each Senator swears to when they enter the office. We often feel that there must often be times when many politicians feel a twinge of guilt when certain things are said or done. ⬆ These words were spoken by one of the guests on All In with Chris Hayes on MSNBC during one of the broadcast. It stuck out. It is hard to imagine how different one’s life is when there isn’t enough food on the table for a family. The reaction was against a group of politicians that were trying to reduce the availability of food stamps. ⬆ It is often difficult to find very many accented characters in metal type. We happen to have Dante which literally has most all of the ones that one would hope were available. 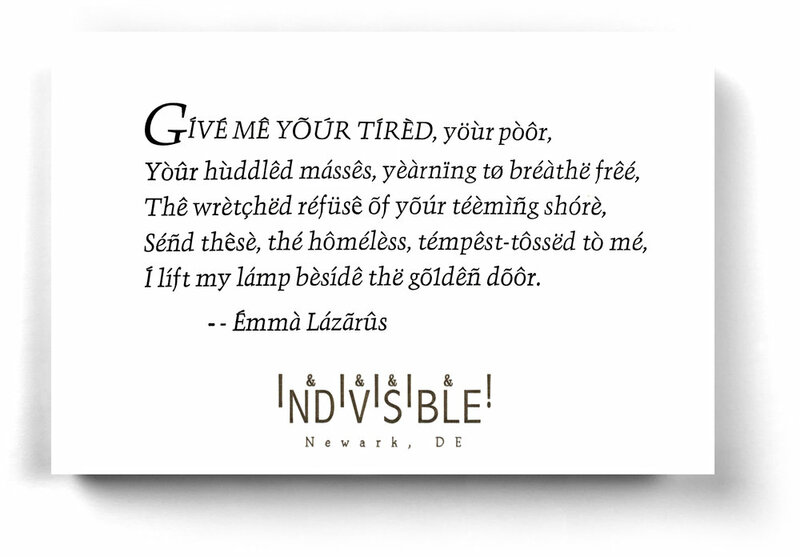 We took the Lazarus poem which is included on the Statue of Liberty and exchanged an accented character in every instance that we could, To us it was a perfect way to express our support for the caravan of Central Americans who were walking the length of Mexico to try and gain admission into the United States. Lead Graffiti has been writing and printing postcards for the resistance group, Indivisible for the better part of a year. Typically printed from hand-composed metal type, the postcards are mailed to all of the U.S. Senators, media people on both sides whom we think should see them, and politically-minded friends from both sides. We recently watched the movie Woman in Gold, which is based on the true story of Nazi confiscation of Jewish property in WWII. Now in our "new normal" world, throw in the Muslim ban, separating families at the border, lessening anti-gas guzzling rules for cars, the systematic destruction of the Environmental Protection Agency, and you can see some of the impetus for our latest card shown above that we've sent to all U.S. Senators. After posting the 1933 card on Instagram, we decided to encourage any followers to offer up their own text for cards. If we got some good ones, we would print them and share copies with the author. If we REALLY liked one, we would send it to the Senators. One of our followers, commenting on our 1933 postcard, mentioned a book about protesting via postcards, Alone in Berlin (shown at the top and we love the typography). Written shortly after the end of WWII, the book by Hans Fallada uses historical Gestapo records as the basis for a fictionalized story of a real couple, Otto and Elise Hampel, who produced handmade anti-Nazi postcards. 285 of the cards were secretly distributed in stairwells around Berlin office and residential buildings for 2 years before the couple was captured, tortured, and executed via guillotine by the Gestapo on April 8, 1943. Below are 4 of the real Otto and Elise Hampel's postcards taken from historical Gestapo records. It gives chills thinking about Otto's hands at work. I wish I could get hi-resolution scans of the cards. Would be an interesting variation on our Indivisible logo using Otto's handwriting. Translations below are by Ester Riehl, Ph.D., University of Delaware Department of Languages, Literatures & Cultures. Thanks to her for the effort. ⬆ Translation : Free Press. Why fight and die for the Hitler plutocrats! All reasonable Germans work to eliminate the Hitler war machine! Stop the further slaughter of fathers and sons! Work slow, produce few children! ⬆ Translation : Hitler's regime will bring us no peace! The baker has no dough! Hitler's practice of putting power before justice brings no peace to the German people. Down with the Hitler crew. ⬆ Translation : German people wake up! We must free ourselves from Hitlerism. ⬆ Translation : Hitler's war is the death of workers! Come what may; no peace with the devilish Hitler regime! The nine-year despicable Nazi system must and will be proved to be a ruin by reasonable Germans! It makes us glad to live in the United States. But yet we still have this unfortunate need to distribute postcards, airing our fears and frustrations. Alone in Berlin is an intriguing book about a time that should not be forgotten nor lived through again. Ray bought it and couldn't put it down. Abebooks.com can quickly locate a copy. We also discovered a movie of the same title starring Brendan Gleeson, Emma Thompson, and Daniel Brühl. We bought it and enjoyed it. Kind of strangely peaceful given the storyline. Most everything in the movie was also included in the book. THIS DISCUSSION OF POSTCARDS brings to mind 2 other Lead Graffiti projects involving them. ⬆ This is one of the first of a dozen or so that we printed for the GPP. For the example above, we might go into a library, newsstand or bookstore and surreptitiously put a card into a book of poetry, homebuilding, or weather. GPP operatives covertly smuggled over 50,000 small poetry cards into books in bookstores and libraries all over the world. The broadsides are still found today. We did a number of the small broadsides, always carrying them with us in case we found a comfortable home for one of them. When people found them, there was an invitation to record the find on the GPP website which kept a tally of where and when the broadsides were found. ADDITONALLY WE'VE GOTTEN peripherally involved with another resistance group called Sisters in Solidarity who get together socially once a month to creatively produce handmade postcards. These are mailed to people who might collaborate in altering the political path of the current U.S. government. ⬆ Here is an example of their work. We love hand done. Wider images work better on our site, so I rotated it, but you get its point. Otto and Elise Hampel might have felt right at home.